Earn money online with a Website. How to earn money online without first spending years studying to become a programming guru. Earning an income online has become a reality for a growing number of people with little or no previous internet business experience. Whether you just need a few hundred extra dollars a month, or would like a full time income, thousands of people are proving the internet can provide this opportunity for you. My friends ask how can I possibly make money just with a website? The best way I can explain this is to use an approximate business model they are already familiar with, the publishing of magazines or newspapers and free to air TV. These businesses have been highly profitable for many years and all have one thing in common. They all provide content which readers and viewers want. The profits come from advertising, affiliate programs, direct sales, e-bay sales and other opportunities which result from the visitors interested in the information on the website. A website following this general model can be very profitable, and can be built for a tiny fraction of the cost of publishing a magazine. "Oh, so very easy" you say, "why didn't I think of that?" OK, OK, I can hear the sarcasm, I know the devil is in the detail! However there is no need to re-invent the wheel here. Literally thousands of home based websites are making good incomes for their owners and you can do the same by following proven, existing methods of building a successful site. Anyone who tells you thousands of dollars can be made overnight with no effort on your part is a con artist of some sort. Online success comes to those with the ability and determination to find the time and do the work to succeed. Let's just take that first step - How do you know which subject to write about? What would you enjoy writing about? Do you have a hobby or a professional skill? Could you write about your home town or country? ; are you interested in music, writing or theatre? ; do you have work skills others could use? - the list is endless, limited only by your imagination. More specifically- How do you determine if you can make a profit with this? Let's do a simple excercise to illustrate partly how to answer this question. Now type a word or phrase into the keyword field and click the Hit Me button. 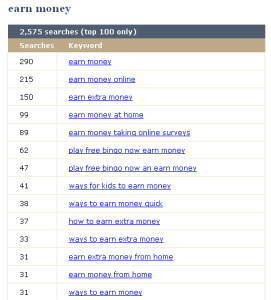 In this example you can see a total of 2,575 searches have been made for variations of the phrase "earn money"
Results like these help take the guesswork out of your decision, you can see exactly what people are searching for on the internet and how they search for it. The internet can provide a wealth of data for anyone thinking of building a website and with the right tools you can build up a picture of whether a particular subject is likely to provide a profitable website. So when you set out to earn money online there is a lot you can do to make the chances of your success very high. On the other hand if you don't do this basic research, your chances of failure are very high. Too many sites start without profits being "built into" the process from DAY 1. Remember the comparison between how magazines make money and how a website makes money online? A website must attract visitors with it's content, the way a magazine attracts readers. Dr Ken Evoy of Sitesell identified this process in his book Make My Site Sell. 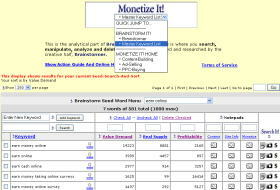 Content Traffic PREsell Monetize is the underlying, logical and powerful process that capitalizes on the fundamental realities of how people use the Web. Using the C T P M process can put you on a solid, profitable business foundation and start you off on a road to successfully earn money online. This is a process which has produced income earning websites for thousands of people ( you can see some examples here ) with little or no previous experience online. Ok, but I still don't even know how to build a website. Well neither do I really, but this site is here and earning! I'd never touched a computer until a few years ago - the reason I use Solo Build It to build this site is because it removes the technical barriers. As well a series of excellent step-by-step videos and help files, a users forum provides insights into the most profitable ways of developing an online business. The "help and be helped" attitude encouraged in these forums really gives everyone in the program a boost. From newbies asking about relatively simple technical problems to experienced marketers sharing their latest discoveries, it is all in here. Many functions such as submitting to search engines or building sitemaps are completely automated by this program. You don't need to know anything upfront about building a Web site in order to succeed. The tedious, "under-the-hood" stuff is handled automatically so you can focus on other important business-building activities. However this program is not just for the newcomers to the net, experienced technical programmers find it allows flexibility and time and cost efficiencies that help where it counts most, improving the real quality that can be delivered to customers. As with any business, you have to start somewhere, the beauty of an online business is the start up investment required is miniscule compared to a business in the offline world. By starting with a complete package like Solo Build It you know there are no more costs involved for the next 12 months which gives you an opportunity to get your business working.